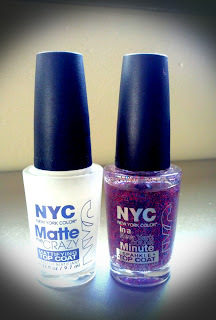 A few days ago, I found a terrific deal on NYC top coats! It was "buy 2 top coats for $3", which is absolutely incredible, even a pack of chewing gum costs more than that! Naturally, I bought some, but at first was slightly worried because what if there was something wrong with them, since they're being sold for such a low price, but luckily they were great! big city dazzle looks gorgeous!